This is the northern end of the North Ramp area. On the left-hand side you can see another MH-60 Pave Hawk parked on the ramp. The third helicopter pad is empty. In the background is a large water tower and behind it the large Shipping and Receiving facility. In the parking area around the building you can see a lot of Government white colored trucks. These are the same kind you see going in and out of the base at the North Gate near Rachel and on Cedar Gate road. Most of the trucks, though, enter the restricted area from the south at Mercury, drive up the NTS on Mercury Highway and enter Area 51 at Station 700, which connects Area 51 and the NTS. 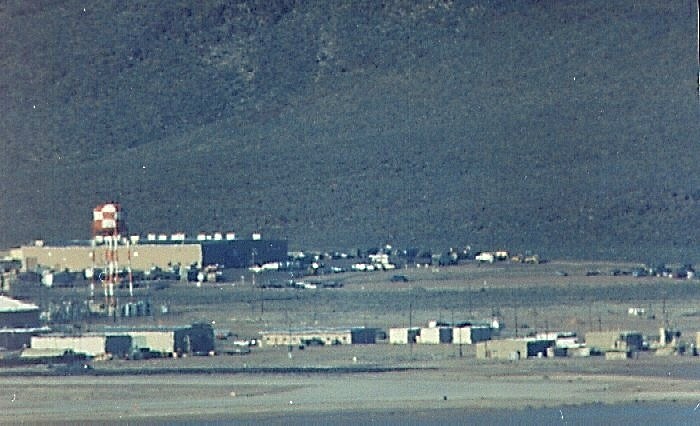 There are two hangar type buildings in the foreground on the left side. The larger of the two is Building 100 (Hangar 2). The smaller one is fairly new. The small building on the extreme left (next to the new one) is Building 103, a Storage Quonset. The fairly large foreground building on the far right is Building 110, the Quick Kill Radar (QK-1) Electronic building. The buildings between QK-1 and Hangar 2 are all fairly new.